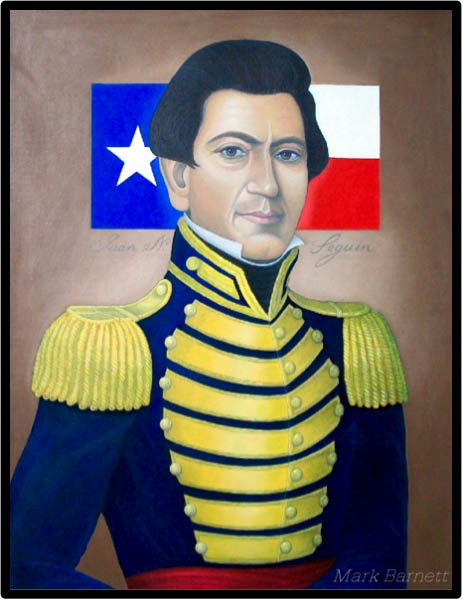 Juan Nepomuceno Seguín (1806–1890), political and military figure of the Texas Revolution and Republic of Texas, was born in San Antonio on October 27, 1806. He was elected alderman in 1828 and served as political chief of the Department of Bexar in 1834. In 1835 he led a militia company to Monclova. After the battle of Gonzales in October 1835, Stephen F. Austin granted a captain’s commission to Seguín, who raised a company of thirty-seven. His company was involved in the fall of 1835 in scouting and supply operations for the revolutionary army, and on December 5 it participated in the assault on Gen. Martín Perfecto de Cos’ army at San Antonio. Seguín entered the Alamo with the other Texan military when Antonio López de Santa Anna’s army arrived, but was sent out as a courier. At Gonzales he organized a company that functioned as the rear guard of Sam Houston’s army, was the only Tejano unit to fight at the battle of San Jacinto, and afterward observed the Mexican army’s retreat. Seguín accepted the Mexican surrender of San Antonio on June 4, 1836, and served as the city’s military commander through the fall of 1837, during which time he directed burial services for the remains of the Alamo dead. He resigned his commission upon election to the Republic of Texas senate at the end of the year. He was the only Mexican Texan in the senate, serving in its second, third, and fourth congress.